Click here to watch our Aussies on YouTube. Scroll down to see photos of our pups. 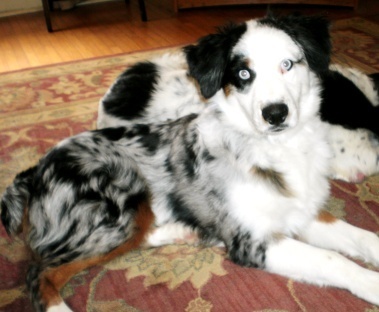 This lovely, dark merle puppy is Stormy who is out of Certik and Zuzka. 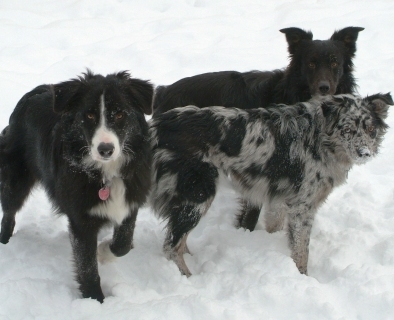 Stormy and her big half-sister Misty live in Illinois, with my dear friend Julie and her husband. "Felix is fearless, confident, a loyal companion, a snuggle bug, and well I could go on forever -- everything we were hoping for. 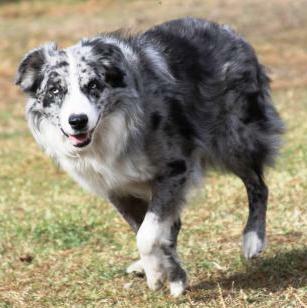 He has all the ingredients to be a phenomenal agility dog!" 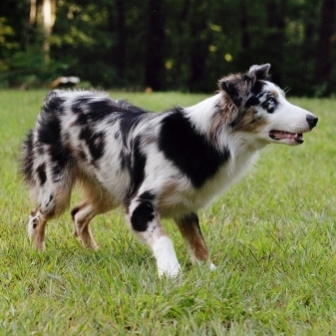 These are just a few words Dominica has to say about her new Blue Merle boy from Babika and Misko. The Pollocks family, inluding Felix live in Canada. 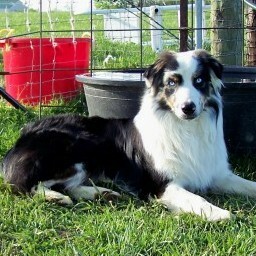 Rooster is Certik's and Babika's puppy from 2011 breeding. This lovely black male resides with Amanda in Wisconsin. Misty is such a gorgeous, smart and talented girl out of Babika and Certik. She lives in Illinois with Julie and her husband on a cattle farm where she helps with daily chores. Yosie is focused and ready to catch her next Frisbie thrown by her beloved family. Yosie is not only an active companion for the Myers family, but also their chickens. Yosie is out of Misko and Zuzka and lives in Gatlinburg, TN. 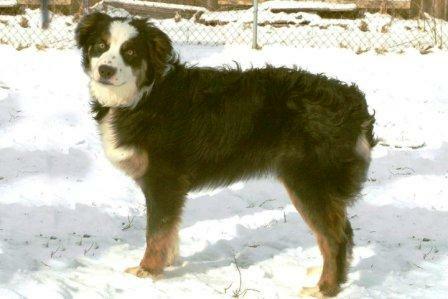 This gorgeous and true representation of an Australian Shepherd is Maco who moved from our farm to Arizona in Spring of 2012. Maco is a dream dog, extremely talented and loving. He is a very versatile dog just like his dad Certik and mom Babika. 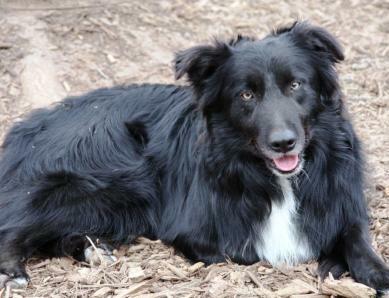 Maco excels in Herding, Agility, Obedience, Rally, Tracking and Frisbie. 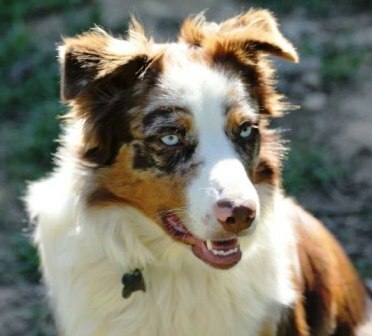 This "wonderful and always entertaining" Aussie is Samwise who lives in North Carolina with Vann and Peggy Waters. 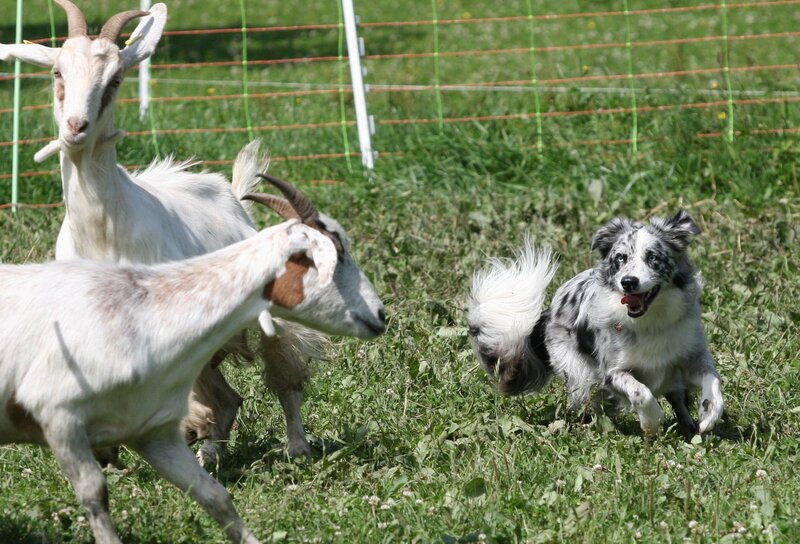 Samwise and Vann are great Agility team. This lovely male is out of Babika and Bam-Bam. Adam is out of Dolly and Certik. This handsome blue merle male helps with cattle on humongous Boyd Ranch in New Mexico. Abby is a lovely female out of Babika and BamBam from our 2010 litter. Abby has her mom's looks. She is a wonderful playmate for Leia's little son Jake. They all live in Southern Indiana. 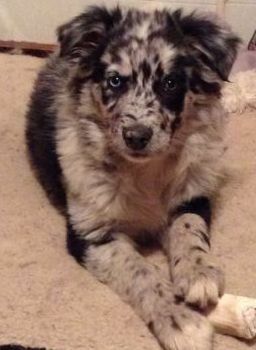 This is Bailey, beautiful black tri female out of BamBam and Zuzka. Bailey lives with Dittemore family in Central Indiana. Maple is one of my favorite. She is a very intellegent working female that lives in Germany with Carmen. Maple's parents are Dolly and Certik. Glenn looks so much like his dad Certik. His mom is Dolly from Rising Sun Farm. Glenn lives in Minnesota. This cute puppy was born at Rising Sun Farm in Minnesota. Her mom is Flair and dad is our Certik. Sprite lives and works at Birch Hollow farm in Wisconsin. Spur is Babika's and Misko's puppy. He is such a lovely and talented handsome boy. Debbie has a lot fun training Spur. They live near Columbus, Indiana. Yoshi is another puppy out of Babika and Misko. Yoshi lives with Teresa and her son in Indiana, south of Indianapolis. Piper is loved by Virginia. They live East of Indianapolis, Indiana. Virginia is very happy with his friendly and even temperament. Piper is out of Babika and BamBam. 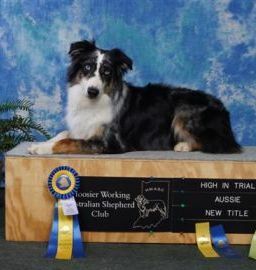 These handsome Aussies are out of Certik and our deceased Echo. They live in Indiana. 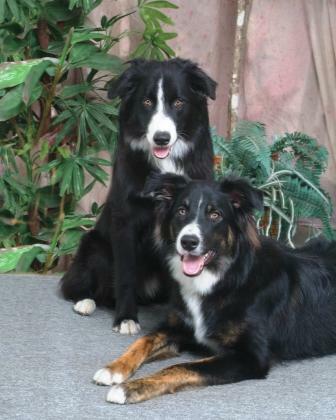 Indy and Huck are again pups out of Certik and Echo from our 2008 litter. Cowgirl is a stunning black tri female out of our Certik and Java (daughter of our BamBam). Cowgirl and Pete (our pupy out of Babika and BamBam) live on a small farm with the Pennington family north of Indianapolis, IN. © 2007 Turkey Run Farm All Rights Reserved. 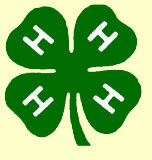 Reproduction in whole or in part in any form or medium without express written permission of Turkey Run Farm is prohibited. Web design by Adriana Plum & Jim Scandlin.